Many artists, writers, and other creative people do their best work when collaborating within a circle of likeminded friends. Experimenting together and challenging one another, they develop the courage to rebel against the established traditions in their field. Out of their discussions they develop a new, shared vision that guides their work even when they work alone. In a unique study that will become a rich source of ideas for professionals and anyone interested in fostering creative work in the arts and sciences, Michael P. Farrell looks at the group dynamics in six collaborative circles: the French Impressionists; Sigmund Freud and his friends; C. S. Lewis, J. R. R. Tolkien, and the Inklings; social reformers Elizabeth Cady Stanton and Susan B. Anthony; the Fugitive poets; and the writers Joseph Conrad and Ford Maddox Ford. He demonstrates how the unusual interactions in these collaborative circles drew out the creativity in each member. Farrell also presents vivid narrative accounts of the roles played by the members of each circle. 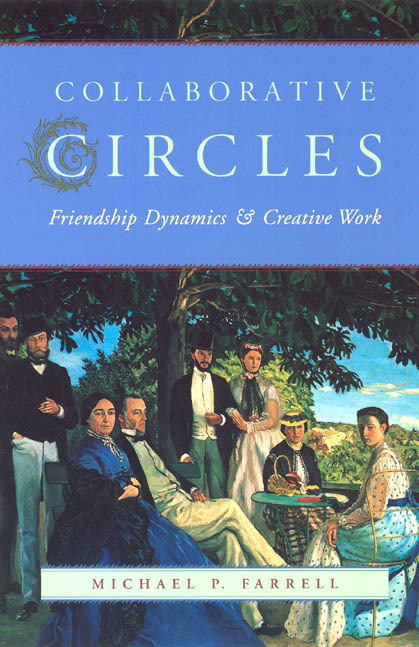 He considers how working in such circles sustains the motivation of each member to do creative work; how collaborative circles shape the individual styles of the persons within them; how leadership roles and interpersonal relationships change as circles develop; and why some circles flourish while others flounder.